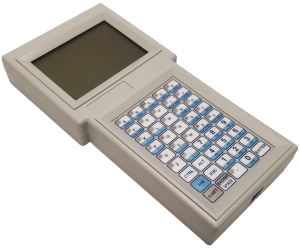 HandHeld Terminal | Anacom, Inc. The AnaCom Hand-Held Terminal works with the software in all AnaCom ODUs, specifically designed for operation from the palm of your hand. The terminal obtains its power directly from the AnaCom ODU or Protection Switch switch, so there are no batteries to worry about; simply plug the Hand-Held Terminal into the M&C connector and begin using it.